I had a typical Torah observant upbringing, also known as Frum From Birth (or FFB, for short). I went to a Jewish Day School, all-girls high school and seminary. Once I entered the first grade, I was no longer allowed to wear pants. Short sleeves were out at fifth grade. And, like a good girl, I followed the rules for years. But now here I was, 22 years old and I really wanted to know what it felt like to wear a pair of jeans. I couldn’t stand being different, wearing boring clothing that was never in fashion. 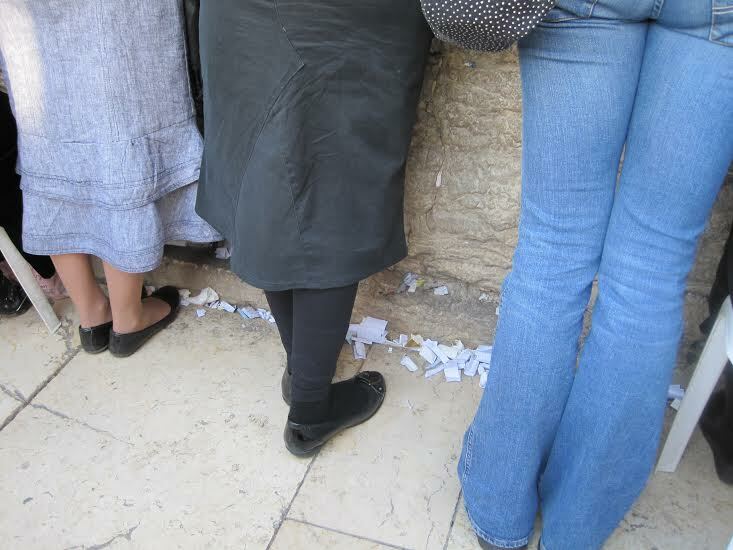 And the criteria that each article of clothing had to meet to fulfill the commandment of tznius or modesty… Is the skirt below my knee? How about when I sit? Is it too tight? Is my shirt too clingy? Is the neckline a bit too low? The sleeves cover my elbows, but when I raise my arms my elbows show a bit. Should I change? And it wasn’t just the convenience. I sometimes would fantasize about how much easier my life would be if I could wear whatever I wanted. I imagined the independence, free at last from the restrictive clothing that only served to make me different and unfashionable. The one thing holding me back was fear. Not fear of God, but fear of other people, what would happen if someone in my community saw me dressed immodestly. Something like this could really hurt my chances of a good shidduch (marriage prospect). But then my chance came and I couldn’t resist. I had a college orientation meeting out of state, where nobody would know me. So I headed to the local Old Navy and hesitantly made my way to the Wall of Jeans. I was so overwhelmed by all the choices. I awkwardly asked a sales associate for some help, and dashed to a nearby dressing room. My heart was pounding. Once inside the dressing room with the door closed, I took a deep breath. For the first time in my adult life, I put on a pair of jeans. I pulled them on and admired myself in the mirror. Satisfied, I took them off, grabbed a tank top and made my way to the register, focusing on the cashier. It suddenly felt very bright and too loud, with a persistent buzzing in my ears. Finally, I was back in my car and on my way home. I kept glancing behind me with paranoia, trying not to look at the bag of clothes sitting on the seat next to me. The day of orientation arrived. I put on my contraband clothing, and covered them with a typical post-seminary outfit: long, black slinky skirt and a shapeless button down shirt. Once I was out of my neighborhood and away from anyone who may recognize me, I took off the skirt and shirt and tossed them into the back seat of the car. When I arrived at the school I felt super exposed. The jeans were so tight around my thighs, and my upper arms were covered in goose bumps, unused to being bare. I was so sure that everyone could see my unease. It didn’t take long for me to get comfortable. I was still a bit insecure about my legs being on display, but I could sit down and cross my legs without readjusting my position to make sure my skirt wasn’t riding up. No need to worry about my shirt riding up from the waistband, showing the forbidden skin on my hips. Most importantly, I was dressed just like everyone else. The next day I took the jeans, and tank top to Goodwill and I haven’t worn pants or sleeveless in the five years since. Why? Yes, it was nice to look like everyone else, and buy the clothes I wanted. But was that enough to make me turn my back on the many aspects of my religion and society that do carry meaning for me? No. The fact is there are 613 commandments, and there is no way that I will ever understand even half of them. Some of them I may even (secretly) find ridiculous. But I know that a Torah life is the only truth there is. I know that it is the truth because of how truly excited I get when I hear an awesome dvar Torah, or listen to a song in which the music perfectly matches the meaning of the Hebrew words from davening. When I teach my children at school that when God told Abraham to count the stars because someday his children would be that many, and then I tell them “You are those stars” and their faces light up, I know it’s truth. Today I told them after praying that they can talk to God whenever they want about whatever, and I told them that we were going to close our eyes and talk to Hashem in our heads to say thank you or ask for something. And you know what? They did. They closed their eyes, some scrunching their eyes closed in intense concentration, others with their hands against the sides of their head or on their eyes. And they sat there, and talked to God. And they were so excited. That is truth, that is emes.